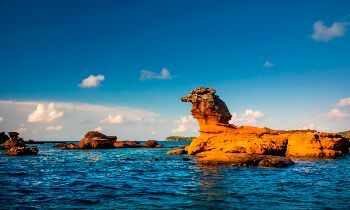 Phu Quoc island is the largest island of Vietnam in the offshore of the southwestern-most coast of Kien Giang province. This is also the most famous and prestige tourist paradise in the south of Vietnam where people often go to enjoy the beautiful sandy tropical beaches and dive in the blue clear water. Nestled in the balmy water of the Gulf of Thailand, Phu Quoc is Vietnam’s largest island and home to the beautiful beaches. This island is surrounded by the gorgeous sandy beaches and covered the green forests which are 45 kilometers off Vietnam’s southwestern inland. Currently undergoing major development, Phu Quoc is a green pearl in the offshore with a lot of luxury resorts, casinos and other facilities for tourists. 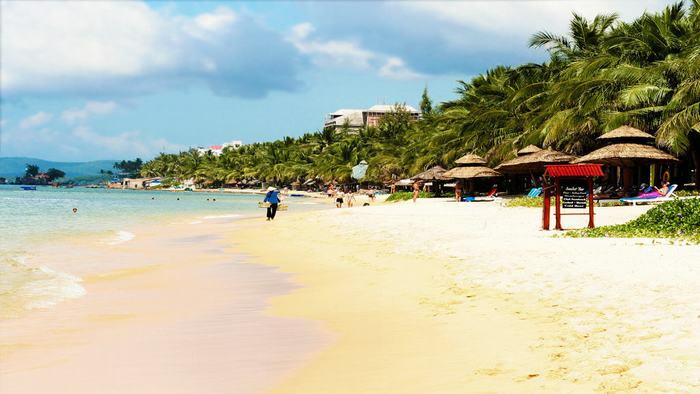 Phu Quoc luckily owns many beautiful beaches that are very suitable for swimming and sunbathing, Long beach is one of the most gorgeous beaches on the island and listed in the must-visit destinations in Phu Quoc. Long beach stretches over 20 kilometers with the smooth sand which becomes the longest beach on the island. Tourists coming to the beach can enjoy the cool air rolling off the ocean and the charming view of the sea and mountain, especially at the sunset, the view here is really spectacular and gorgeous. Long Beach is located on the west coast of Phu Quoc island, and just 10 kilometers from Phu Quoc Airport. So, it is very convenient for you to relax after a long flying time. Visiting this beach, you can have a chance to bathe yourself into the clear blue water, the golden sand beach, gorgeous sunset and enjoy the best drink of the world-the coconut water. Besides that, tourists getting here can join in many interesting activities such as snorkeling, swimming, kayaking, etc. 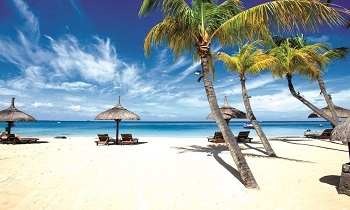 For those who want to relax on the beach, it is better to choose a resort among many beautiful resorts along the beach. This is also the place where you can visit some pearl farms and fish sauce companies. This is where one of the most delicious brands of fish sauce in Vietnam is produced. 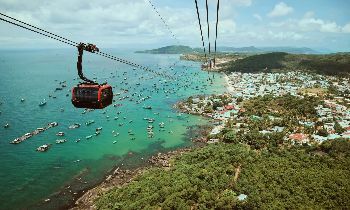 Located on the northwest coast of Phu Quoc island, which is about 28 kilometers from Duong Dong, Ganh Dau beach is a great attraction in Phu Quoc that tourists should not miss. The beach is nestled in a fishing village which has white smooth sand, pristine forests, and mountains. 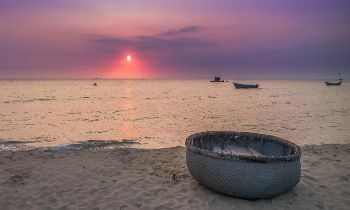 From Ganh Dau beach, you can see Cambodia in the far distance. There are the luxury resorts in Ganh Dau beach, some of them are Gio Bien resort and Peppercorn resort. Ganh Dau beach is an ideal place for you to contemplate the sea eagle which is a kind of big bird living in the tropical southern sea. 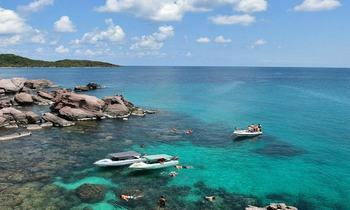 It is better to rent a boat to admire the great view and comfortably swimming and snorkeling. While diving, you can see a variety of fish and marine species under the water such as crabs, clams, and vividly coral. People say that the trip to Phu Quoc will be not complete if you don’t visit Dinh Cau temple. This temple is located on an oddly shaped rock on the bank of Duong Dong river’s mouth. 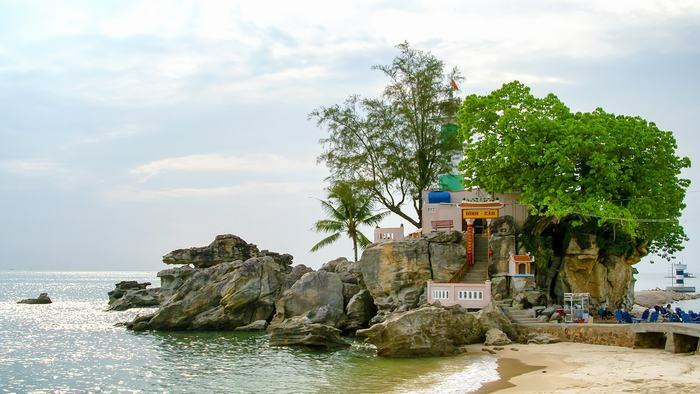 This temple is the most popular site in Phu Quoc because it is located near Long beach which is the largest and most famous beach of the island. This temple plays an important role in Phu Quoc local people’s spirit. Before starting a fishing trip, the villagers come to this sacred place and bring the offerings to pray for a safe trip. Besides that, from the temple, you can see a spectacular sunset moment and take the best photos of the sea and sky of Phu Quoc. Nestled about 20 kilometers from Duong Dong town, Ham Ninh village is famous for its beautiful landscape as well as the peaceful living rhythm of local people. In the past. 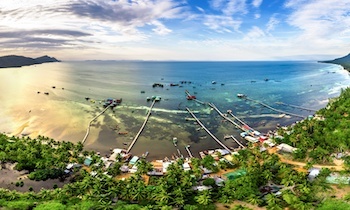 most of the people in this village earn living by fishing but thanks to the tourist development of Phu Quoc, a part of villages has changed their job like selling seafood or souvenir for tourists. When visiting Ham Ninh village in the summer, you will be lost into the natural picturesque scenery here. With the turquoise sea, you will freely immerse yourself into the clean and cool water while still contemplating those small fishes swimming beside and seaweeds floating into the blue water. Then, after being tired of swimming, let’s go to the beach to enjoy the delicious seafood dishes and drink the sweet coconut water. Located on the east coast of Phu Quoc island, Sao beach is a beautiful beach that attracts a large number of tourists each year. 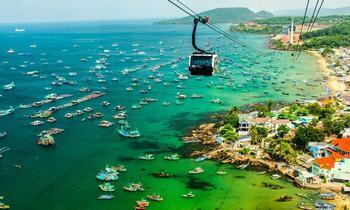 In reality, Sao beach is always on top best beaches in Vietnam as well as Southeast Asia. Sao beach is about 7 kilometers which are very famous for white sand. The sand here is smooth but a bit slope. Moreover, during the tide period, tourists could see sand ripples that resemble a sandbar. This destination is also great for taking photos, especially during low tide in the morning. 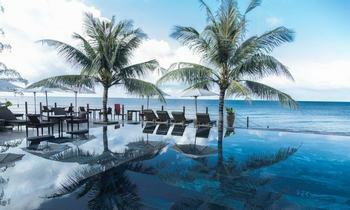 The peaceful tropical paradise of Phu Quoc is an ideal destination to escape the heat and enjoy the rare holidays. 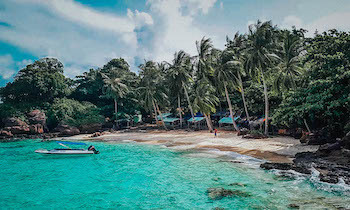 For the time being, tourists visiting Phu Quoc have chances to enjoy the experiences of finding a remote beach lined with coconut trees and calm blue waters. If you have any questions, feel free to contact us. Thank you!